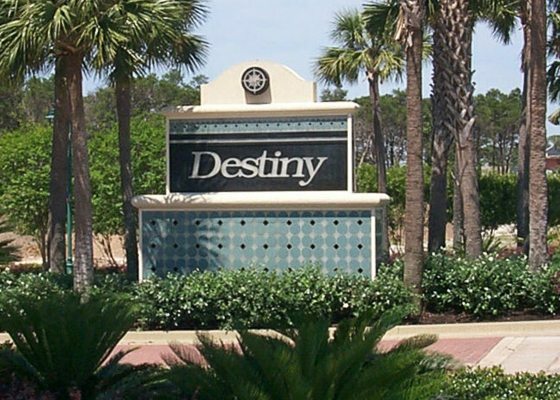 The Destiny community, comprised of Destiny, Destiny Shores, Destiny By The Sea, Destiny East, Grand Palms at Destiny, and the Beach Villas at Destiny, became one of the most sought-after, premier developments in Destin and the surrounding area. This prompted The Jay Odom Group to create Destiny Realty for buying and selling real estate within the Destiny neighborhoods. The Destiny developments were all handled in-house by Destiny Realty. When creating the Destiny Master Plan, Scenic Hwy 98 in Destin ran in such close proximity to the beach, it impeded master-planned development. The Jay Odom Group successfully relocated Scenic Hwy 98 to create the 120-lot Gulf front neighborhood of Destiny By The Sea, which included a pedestrian and golf cart tunnel for safe and easy access across the relocated highway to and from the beach.